SEATTLE--(BUSINESS WIRE)--Jun. 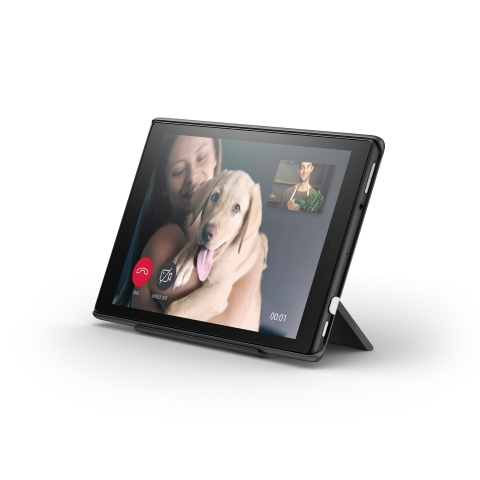 28, 2018-- (NASDAQ: AMZN)—Amazon today announced Show Mode: a new, immersive hands-free Alexa experience for Fire HD 8 and Fire HD 10 tablets that provides full-screen visuals that complement voice responses from Alexa. Show Mode lets you ask Alexa to see trending news, weather, camera feeds, and more—all glanceable whether you’re up close or across the room. Also available is the new Show Mode Charging Dock, a docking station for current generation Fire HD 8 and Fire HD 10 tablets that automatically transitions the tablet into Show Mode and holds the device at an adjustable angle while charging. Using the Show Mode Charging Dock, just ask Alexa to show you a recipe, set a timer, and then announce that dinner’s ready through other Echo devices in your home—all hands-free. You can also ask Alexa to start a video call with friends and family, watch a movie or TV show, play your flash briefing or Audible book on your Fire tablet while in the Show Mode Charging Dock; or if you want to move to a different room—just grab the tablet and go. You can also use Show Mode to play your favorite music. Just ask Alexa to play a song, station, or genre and Show Mode displays the song lyrics on your tablet screen. For even richer audio sound, connect your Fire tablet to an external speaker via Bluetooth. The Show Mode Charging Dock design is small enough to fit on a kitchen counter, nightstand, or desk and is easy to use for wire-free charging. It comes with a case and adjustable stand—just place your Fire tablet in the case and drop it into the stand; magnets on the case will guide the tablet into position for charging while the stand holds your Fire tablet at an adjustable angle for easy viewing. As a special introductory offer, Show Mode Charging Dock for Fire HD 8 is $34.99 (regularly $39.99) and is available for pre-order at www.amazon.com/ShowModeDock8. Show Mode Charging Dock for Fire HD 10 is $49.99 (regularly $54.99) and is available for pre-order at www.amazon.com/ShowModeDock10. Show Mode Charging Dock will begin shipping on July 12. Show Mode Charging Dock is also available bundled with a Fire HD 8 tablet starting at $109.98—a $10 savings, or bundled with a Fire HD 10 tablet starting at $189.98—a $15 savings. Additional Show Mode Charging Dock stands and cases will also be available on Amazon.com starting July 12. Show Mode will be delivered to current generation Fire HD 8 and Fire HD 10 tablets via a free, over-the-air software update, rolling out to customers starting July 2.